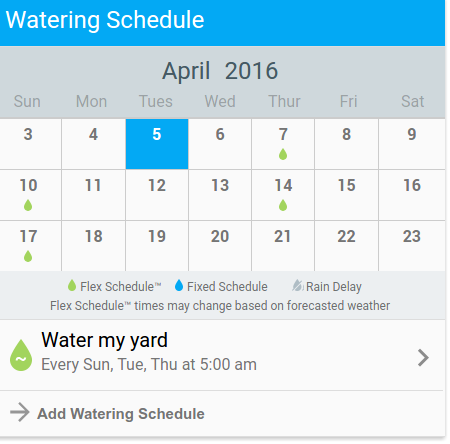 Flex schedules show "not scheduled"
My whole yard (9 zones) is on flex scheduling… Essentially on complete autopilot. Now, A bunch of my zones are showing “not scheduled”. My calendar shows not green water drops beyond today.I live in Los Angeles and it hasn’t rained in weeks nor is not forcasted to rain… What’s up? Based on the calendar seeing that they will run tomorrow and throughout the month. Just a heads-up I usually recommend adding a few zones and seeing how they behave at first. Now, A bunch of my zones are showing “not scheduled”. @steve28, it’s also important to remember that Flex schedules will water on a zone by zone basis within the watering window configured. Are the zones that are not scheduled tree or shrub zones? Usually these vegetation types will water less frequently, but longer to refill the deep root zone (water “gas” tank) that the roots can pull water from. Yeah, I can’t wait for the new scheduling… One question I have about that. Will it be possible to put a time limit in as well? Watering with sprinklers is limited to one cycle of up to 8 minutes per station per watering day for non-conserving nozzle sprinkler systems (typical residential system), or two 15-minute cycles per watering day for conserving nozzle sprinkler systems. So with these restrictions, flex would not even be a good option since they are so limiting. Water as needed won’t really work as we build a schedule that will automatically adjust its frequency and duration throughout the months. IMHO with smart controllers these type of restrictions will eventually go away. You can still take advantage of our smart cycle feature (http://support.rachio.com/article/283-smart-cycle-overview) and the other weather intelligence settings that will automatically skip for rain and cooler weather events. With your limited restrictions I would definitely disable our water budget feature which will want to +/- your minutes. With the small window of watering you have really it doesn’t make a lot of sense to make micro adjustments to your durations.